2. Using your two fingers, pull down the status bar from the top of the screen. 3. Tap on Side Key Panel from the next screen. 4. The side key panel (with primary buttons) will now appear on the left corner of the Home screen, by default. 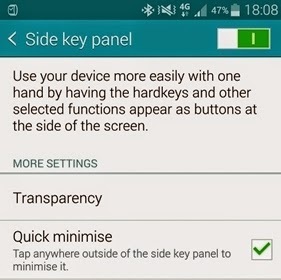 Another way to access the Side key panel is by tapping Apps on the Home screen, tap Settings, select Display and Wallpaper under device settings, select One-handed operation, and finally, select Side key panel. Drag the switch to the right direction to turn the side key panel on and enable the feature. 5. Once you've enabled the side key panel, you can now control your device and use it with one hand by having the hard key as buttons at the side of the screen. One of the side key panel options you can enable for use is Quick Minimize, allowing you to tap anywhere outside of the side key panel to minimize it. To enable Quick Minimize, tap to mark/check the checkbox next to Quick minimize under Side key panel screen. To expand the quick side panel, simply swipe across the side of the side key panel from the near edge to the middle of the screen. If you want to move the side key panel, just tap and hold the movement icon, then drag it to anywhere you want it to show on the screen. You can also set up transparency of the side key panel. To do so, tap on Transparency from the side key panel More settings option. When prompted, use the slider or drag it to adjust the panel's transparency, then tap OK to apply changes. The option to Manage keys in the side key panel allows you to customize which buttons display on your side key panel. To get this done, tap on Manage keys. On the next screen, tap and hold an icon, then drag the buttons to add, remove or re-order them. For example, if you want to add icons to the panel, just drag these icons from the Available keys section to the Shown on panel section. Among all the one-handed operation solutions integrated in the series of Note devices, the Galaxy Note 4's side key panel is so far deemed the most innovative and practical, especially in terms of functionality and how it addresses most phablet users' demands.